Creating a business is not very complicated in itself, however making it successful is much more difficult. Changing the dinosaurs in the industry and showing them a new way of doing things is almost irrational. Create an international career with guys who don’t live in California, or literally create legends, collaborate with the most influential pros or receive the best team award against Flip, Baker, Zero in 2005.
and once again goes on an adventure with his new company; Film Trucks. Hi Jérémie, you are literally the first to have managed to impose your brand in France, at a time when nobody thought it was possible to have a legit skateboarding company in Europe with European pros. How did the shops and distributors react when you announced it to them? It was long, at the beginning it was complicated, it was necessary to change all mentalities, nobody really believed me. I showed them that I was serious, that there was an advantage with the stores to have cheaper products, with local marketing, something that was very important. Before marketing, magazines just aired ads of what was happening in the United States. The goal was to show them that things were happening here, and to show them people here. By sponsoring people from here it could energize the local scene, and it was good for the stores. But it was slow. It was also the situation of the 2000s, with the arrival of Barcelona, ​​where all the American teams traveled, there was the video Menikmati, which was released almost at the same time as the Europa (the first Cliché Video) when we skated the same spots. There was a good timing! Do some people think you were crazy and try to discourage yourself? For example with the name, there are plenty of people who found it weird at first, but a name, it’s up to you to do something good with it. You see at the beginning of Girl, say that a company will be called “girl”, 25 years ago when it was a super macho sport, no one would have believed in this magnitude. After it’s up to you to do something good, like pizza skateboards, haha! Hahaha, yes, it’s a bit strange as the company name, Pizza Skateboards. There are people who are not too much into skateboarding, and they ask you what the new boards are, you tell them there is “Pizza Skateboards”, he tells you “What’s that name? “. Haha. After it’s up to you to believe in it. 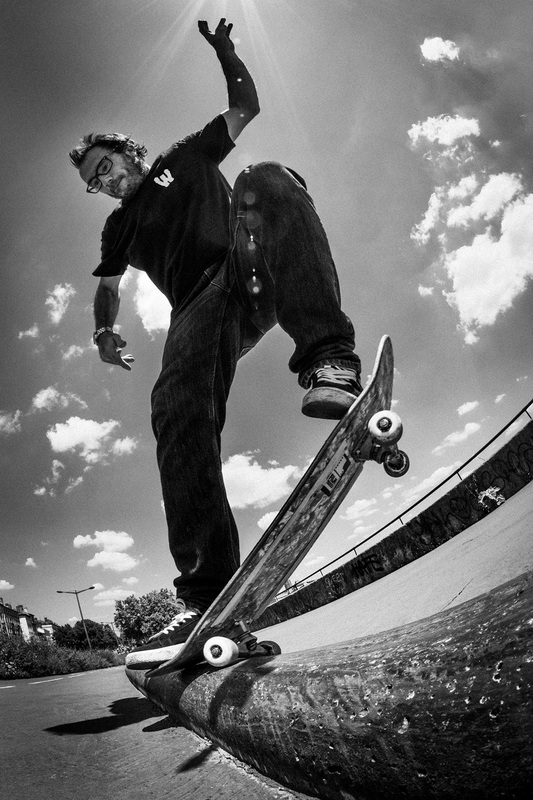 In Europe, for my generation there were no pros, I could not live from skateboarding, and being pro. And so that’s why I always wanted to work in skateboarding, I pushed this company to try to live from it. You had opportunities to become a pro in the United States and live there back then. Did you try to base your career in the U.S., or did you want to stay in France? I did not really try, I went there several times, I had contacts with a lot of companies. My goal was to stay in Europe, in France. I guess you had moments of doubt, from what moment did you know that Cliché was solid? It’s never solid, today it’s no longer cool to be a big company. Today’s cool is to be a small company. You can never be sure. Look with Girl! I’m sure it’s hard for them right now. There were moments of doubt, when there were series of boards of less good quality, or when there are pros who left. There were moments with more satisfaction when we made a good video, when we worked with good artists. There are ups and downs. There is no moment of certainty, even more now where things are going super fast, with internet. 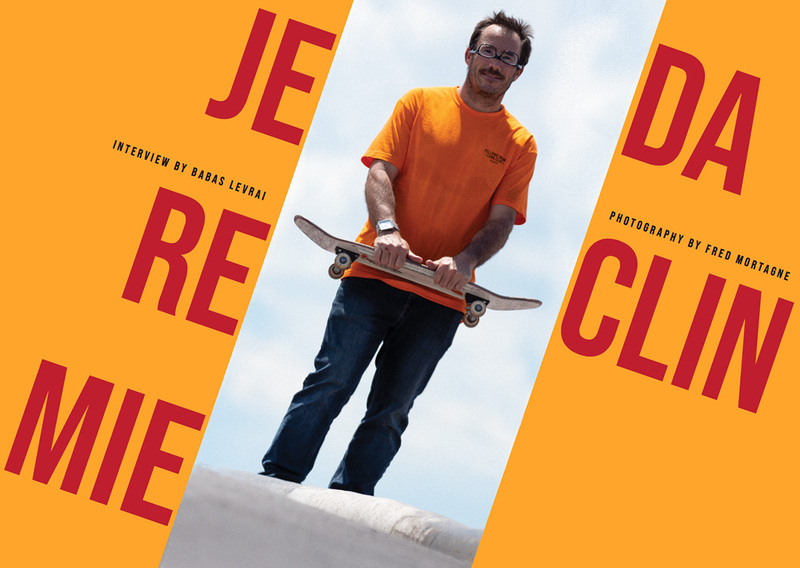 Seen from the outside, Cliché has contributed enormously to the French skate scene, notably producing videos and photos at French spots that became legendary. Did you sometimes have phone calls from pros that you had never met to come to skate French spots? Absolutely! In Lyon, whenever there are people who come I want to show them all the spots for them to spend a better time in Lyon, and to skate with them. I think it’s good for Lyon, the local scene, and indirectly good for my company. I always wanted to have some hospitality for people, even if I did not know them very well, I received an E-mail, I’m from the team, blah blah, I answer him that I can find him a hotel here or there, go in this district, and give yourself the appointment. I have a van, I can drive you. I always try to move people to the max. For example, Morgan Campbell who is Australian, he came to Lyon, he stays a moment here, he had an apartment. He told me that in Australia, there is a spot that has been named the “white banks” in honor of the spot in Lyon with white inclined banks. It was cool to see that abroad there are spots that have been named according to Lyon. The stopping of Cliché was a shock for many people, I heard that Dwindle had proposed to resell Cliché to continue it from your side, as with what happened with Zero and Jamie Thomas. I heard that you refused the offer? Yes that’s right, they offered us to take Cliché at an independent level. With Al Bolgio and Eric Frenay the graphic designer who did all the stuff for Cliché. We asked ourselves the question; do we take this on, do we start a new company, or does everyone go on his side? And it’s true that it’s complicated the skateboarding market, you see “Numbers” it’s not because they have Guy Mariano and company that it will work well. Now it takes an image, we weigh the pros and cons and everyone is gone on his side. Were all these years with Cliché burning you and you needed changes? No, I’m always motivated to be in skateboarding and doing things, I have Film Trucks. It’s good to have a new challenge. So it was a general decision to stop Cliché, it did not come from you in particular. After Cliché, you tried to launch “Bonjour Skateboards” with Lucas Then, Max Geronzi, JB Gillet and Flo Mirtain, but the budget did not follow with the wages of the skaters, would it not have been less complicated to start with strangers like you had already done with Cliché? That’s what I said just before, it was the problem of starting a new company, they all wanted to continue with us, but it was complicated. Finally « Bonjour » stops, and you start Film Trucks. It stops… it never started! It was in the pipes, we made a project with boards, we had to present all the boards to Lucas, JB, Flo and Max, he was down. And it was me, Eric and Al, we weigh the pros and cons and made our decision. I remember of Film Bearings back then, where you took the name to make Film Trucks, it may be a project on stand-by will later see the light of day? Yes, I do not know, nothing is forbidden! The name I decided to keep, it was a wink for continuity Few people were aware of the name before, and new skaters don’t know. The name is short, it sounds good and all that. I remember, I had a Film Bearing T-shirt 15 years ago, and I had never seen the bearing in my life, I knew that it came from Cliché, I think it was Bertrand Soubrier (Haze Wheels), who had brought this at the time. That’s right, he was on Film Bearings at the time? Do you think it would be impossible to sell a brand with a French name, which would not be translated into English? Cliché is a word that is pronounced in French when you use it in English, it is a word that has an accent on the “E”, something that does not exist in English. It was a typical French word. But you think that a word with any French sound would be possible? Ahahaha! I do not know if it would work, but hey, there is Pizza Skateboards that exists! The idea with Bonjour, it was a bit like that, there are words that exist that are internationally known, as in French Italians etc. There is a palette of words that exist in all languages that can be used. 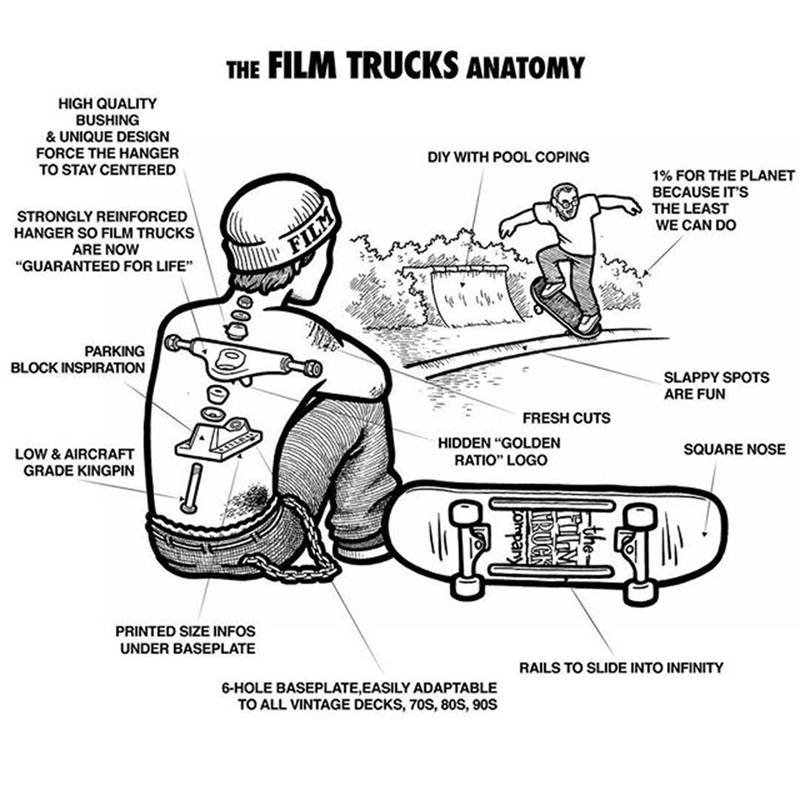 What are Film Trucks, and are they better than other brand trucks? The goal is a bit like the beginning of Cliché, because there is no alternative. To arrive with a French and European alternative. A truck with equivalent quality from other companies, but that will be less expensive because there will not be the network of the usual distributors. The goal is also that the stores have good margins, and cheaper. Skate shops are a very important link in skateboarding. All the people who become famous, their first sponsor was a skateshop. All those who go into a skateshop is what made them dream and keep to skateboarding. There are premieres of videos. Skateshop is really important. Also as I did with Cliché, have a European scene, sponsor people, touring etc. I am at an age where I have very bad knees and back, and that’s why I do a lot of slappies. I spend my time doing grinds on the curbs. That’s why the truck is important for me. It’s funny that you say that, because I’m 43, and my obstacles become smaller and smaller. When I was 15 I never paid attention to my trucks, I took any I could get my hands on and they worked. But now as I get older, it looks like the truck has become more important on my set up than before. You jump less, and you curve more. How are they better for slappy’s? They say it’s hard to re-invent the wheel. But there are little things, like on the base there are 6 holes, if you want to mount old boards without drilling extra holes. The Kingpin is very low, and not touching when you grind. They have some small details like that. What is the process for drawing a truck? I guess it’s not easy, you have to respect some physical laws to make it work. It goes on some small ideas, I wanted it to go on the parking block for the enbase. Little stories you can tell about the design. Did you draw it yourself or did you get help? It’s me who is coming up with the ideas, and I’m working with someone who does skateboard design especially, Eric Santianeno. Were you inspired by existing trucks to draw yours? No, not really inspiration! When you have a skateboard company you go to the factories, and you will have access to the existing board. When you make wheels, they have standard wheels, you take that one, you put your logo on it. For trucks it’s complicated because you have to pay for molds, there are several sizes, it’s a big investment. Are you going to produce more trucks for the street or for the transition? I have 5 different sizes! Your truck wheelbase is closer to Indy or Thunder? Closer to the Indy than the Thunder. So closer for better carve. Your plans for 2018? Make it evolve and make Film become a Truck brand in itself. The goal is to find good distributors, install the brand. In the truck market, there are 4, 5 actors, and the goal was to arrive 6th, and that the store tries the product, finds a commercial interest to make good margins because it is not expensive. And of course skaters skate it, it’s going well. It’s really the approach of Cliché 20 years ago, haha. You started it at zero once again, it’s the game! Are you going to create a team like you did with Cliché? It is true that the teams of Skate Trucks there is not much happening, and the goal is to make a team and start paying people, doing tour. Do it all step by step. Are you going to try to go international again, trying not to make the same mistakes as with Cliché? Yes, for now I am already selling in Germany, Italy, Taiwan, Switzerland. I find distributors, there are people who contact me. 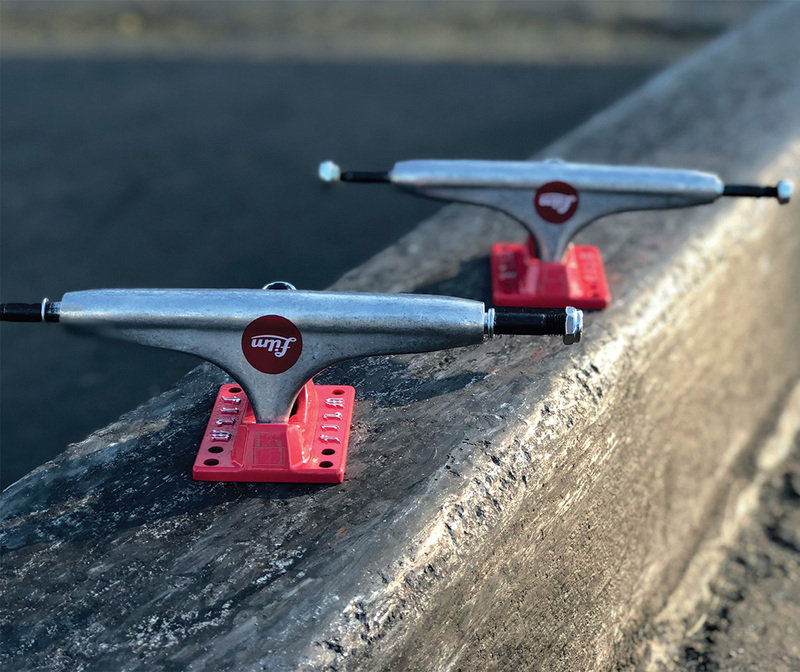 It works well, there is a lot of skateboard brands, and always a lot of new ones, but brands of trucks there are not many. Often the new distributors who make small brands like Magenta, Pass-Port and even Polar, they do not have trucks, like Deluxe or NHS. And I enter this dynamic of the new small brand with these small distributors who are very active, who contact us, because it is small distributors who move well and are very involved in skateboarding. Editor Note: When this interview was made, Cliché was shut down. Since then, Dwindle has recently restarted Cliché without the skate team , and neither Jeremie Daclin & Al Boglio involvement.